The stunningly high price of Berkshire Hathaway stock—now over $100,000—might make many companies consider a stock split. Investors like splits because they can make the equity trade easier. There’s a far more limited numbers of buyers for a stock priced at $100K than at $100. But Berkshire Hathaway has refused to split its stock despite the constraints this might put on the liquidity of the stock. Today we learned why. CNBC’s Liz Claman spent six hours with Berkshire boss Warren Buffett yesterday, and the Oracle of Omaha revealed why the stock doesn’t split—his salary is directly tied to the price of the shares. His pay is based on the market price of the company’s shares, so any split would reduce his pay. Of course, the company could always split adjust his pay, so this isn’t entirely a serious answer. But it demonstrates how a metric designed by bring management’s incentives in line with shareholder interests can have perverse effects. Linking executive pay to stock price seems like a good idea but here we see it acting to deny shareholders the value of a stock split. This thing’s only been going on for three years. 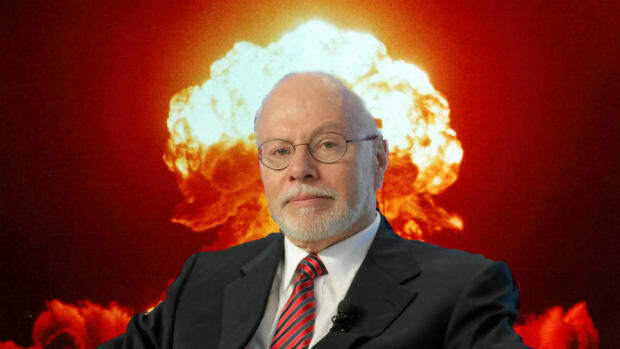 Elliott Management has not even begun to fight. On March 30, 2011, Warren Buffett penned an open letter expressing support for his former lieutenant, David Sokol, whose trading activities had been called into question. "Neither Dave nor I feel his Lubrizol purchases were in any way unlawful," Buffett wrote. Then, a month later, he told shareholders and reporters gathered at the BKR annual meeting in Omaha that, actually, Sokol was a degenerate bum; a piece of garbage that needed to be taken out, lest it stink up the place. (Actual words: "inexcusable," "inexplicable," in violation of "the company's insider-trading rules and code of ethics." Buffett added that Berkshire "had turned over some very damning evidence" re: Sokol to the Securities and Exchange Commission, to boot.) Though Sokol did not publicly respond to the comments at the time, they presumably stung quite a bit, since having your unassailable ex-boss basically call you a lowlife does not do wonders for the reputation. Now, a year later, after being informed that the SEC would not be taking action against him, is he in a Zen place about life in general and Buffett's words specifically? Are the two men cool? Could Sokol see them being friends again one day? At the very least, is he ready to laugh about them? Yes, yes he is.